His news is bigger than your news. Will Ferrell is Ron Burgundy, a top-rated 1970`s San Diego anchorman who believes women have a place in the newsroom - as long as they stick to covering fashion shows or latebreaking cooking stories. So when Ron is told he`ll be working with a bright young newswoman (Christina Applegate) who`s beautiful, ambitious and smart enough to be more than eye candy, it`s not just a clash of two TV people with really great hair - it`s war! 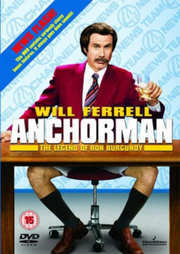 Filled with wicked wit and slapstick humour, Anchorman is the year`s most wildly irreverent, must-see comedy hit!